I am Blogman so I sit in church and turn sermons into blog posts. In a recent sermon at the church I attend, our pastor gave a sermon about praying with importunity. This sermon which was based on Luke 11:5-10 described how the most effective way to get prayers answered was to pester God about what we want. We should pray without ceasing even if we are repeating ourselves. Like kids nagging their parents, we need to be persistent in our pleas. I'd heard the verses and sentiments before but I'd never heard the concept put quite in the way the pastor had put it. Then as I thought about this idea I realized that I blog with importunity. I frequently go back to the same topics. I'll take an idea and break it down. If one post about a topic isn't enough I might make a series out of it. I suppose some readers get bored with my rehashing of topics, but sometimes I'm just trying to get my point across, However, most of the time I blog about certain topics because they fascinate me. Marketing, promotion, "blog science", and the psychology and mechanics of social media. They are topics I am trying to figure out and am hoping some answers will come from readers or just come to me as a result of thinking about it so much. So whenever you think I'm being pertinacious, dogged, or persistent to the max, please bear with me. I hope you will find something interesting in what I'm saying or discover a relevance in my topics applicable to your own purposes. Honestly, I'm not trying to be annoying. I'm just blogging with importunity. Sorry but I just love that expression and had to use it in a blog post. Do you ever feel like you blog with importunity? Are there any topics that people might think you are fixated on? Do you believe that an author basically has one story to tell and they just repeat it in different ways? That’s right! Time to roast a new victim. This year’s hosts are Mark “Madman” Koopmans, Alex “Clone me a” Cavanaugh, Morg “the Borg” Shamy, Stephen “Wormhole” Tremp, and David “Don’t Mess with the” King. Today's the day when the lucky (????) roast honoree is announced. Who on Earth will it be? Is the person even from Earth? One thing that I open dislike about my blog is the fact that generally it centres around one thing, myself and my life. I wish I could branch out and will keep trying but for now I can't blog with importunity, a word which I've only just learned today. Saying that I love your posts even if you don't blog on a diversity of topics that's as wide as you'd like it to be (I think it's wide enough) but thank you for teaching me a brand new word today haha, that's never a bad way to start the day my friends. My first comment got eaten because we were commenting at the same time!! My blogging formula is different, so I don't repeat topics. And pester God? I've always heard the opposite - God knows our needs, even before we pray. So when we do, we should thank God for answering our prayer, even before we see it answered, because He already has taken care of it. My blog is my diary so it is rather based on me and what I do, it was always meant to be a single coherent entity from the day it started. And I think many folk have come and gone because of this, but it is what it was planned to be. I have lost two very close friends this year to cancer so I have been pestering God rather a lot. I keep trying to work out what the great master plan is, but the longer I'm about the more confused it appears to be. Yes, I agree, my blog is my diary so it can't help being about me and my life. Searching for answers to various topics is a great way to write Lee importunate or not. Do continue to wonder. My blog is also very personal, so it's not the same thing. As to pestering God, I'm not sure how I feel about that. I think if I ask once, it's enough. Oh, yes, who is being roasted??? I like that word too. I'm not much of an importunity blogger. I plan about 2 to 3 weeks ahead. I don't think I post about the exact same thing, but probably do it in the same topic and expand on the idea like you do. Sometimes I babble about the same nonsense on my blog and I feel I should branch out and cover other topics. But then where would I stop? I feel as long as what I'm writing about pertains to my writing, then I'll have a more focused blog. I think it's ok to repeat certain topics. It would be hard to say everything you want to say in one post. And as you acquire more readers, they probably won't have even seen your earlier posts on the subjects. You may even have changed your mind or have something new to say that was better than the first time. I guess that's one of the cool things about getting older, is that your views change. I think it's fun to revisit an old topic and explore it differently than you did before. That's the classy way, I guess, of "recycling an idea." Yeamie--What you dislike about your blog is probably what most endears your readers about it. You do a fine job at what you do. Alex -- Check out "pray with importunity" on Google. I had always thought what you said but the sermon changed my way of thinking. Apparently it's a fairly common sermon topic and it makes sense when you start thinking about it. Thanks for the honor of being roasted! Rob -- Prayers always get answered--it's partly up to us to understand why the answer was the answer we received. Blogging can be a mystery as well. Jo -- I think it's a bad sign if we ever stop being curious about things in our lives and in the universe. A blog as diary ponders self and allows readers to compare and contrast their own lives with the blogger they're reading. JoJo -- I continue to be impressed by your craftiness and the cool things you find and take pictures of. Keep doing what you do because that is who you are. Karen -- Even though you're dealing with very personal things you have a theme and a theme is importunate in a sense. Read up on importunate prayer-- there is a logic to it and it's not so much about making God hear as it is learning by repetition or practice. Susan GK-- I plan as well, but it still leads to importunate blogging. That's my niche in a way. Southpaw-- People have to constantly reminded about CAPTCHA since it never totally goes away. Sarah -- I totally agree with what you say. Some people make careers out of repeating the same things because that's what they're famous for. They are experts in their fields or at least know how to discuss certain topics very well. Beer-- When you get a schtick going that seems to work okay, sometimes it's best to stick with it. Then too, senility can cause repetition. I hope I not falling into the latter. >>... This sermon which was based on Luke 11:5-10 described how the most effective way to get prayers answered was to pester God about what we want. We should pray without ceasing even if we are repeating ourselves. That's a pretty good example of why I do not call myself a "Christian" and why I do not regularly attend any Christian church. I'm sure no one really wants a detailed explanation of the reasons for my disagreement and an overview of my beliefs. But I will briefly say that the majority of Christian pastors are NOT teaching the Word from what God's Holy Spirit has personally taught them, but are simply repeating what they were taught in seminary and/or teaching a theology based on their own purely mental (i.e., not Spiritual) interpretations of Scripture. For one thing, the passage in Luke should NOT be combined with Paul's advice to "pray without ceasing", as they do not pertain to the same concept. Years ago in a religious debate, my opponent asked me: How many times do you Christians have to pray to God for something before He will answer your prayer? Is there a specific number of prayers God is waiting for before He will respond to your plea? I told her, A) Don't call me a "Christan", and B) don't ASSume you know any of my Religious / Theological / Spiritual beliefs unless I specifically spell them out for you. See, it's sermons like that which make the followers of Jesus seem like such a laughingstock in the eyes of much of the secular world. Sorry, Brother Bird, I didn't mean to go off on a "rantangent", especially since you were simply just attempting to innocently apply the theme of the sermon in a blogging way. But it really does bother me when I see a superficial understanding of Bible verses - particularly from "a man of the cloth" - add more fuel for the mocking of Jesus' followers by ignorant atheists. Sermons like that only set us back in trying to convince the world that The Word Of God is The Word Of Eternal Truth. This post just made my day. I have a weak spot for bloggers who incorporate their spirituality with their online writing! Anyway, I've heard a version of this concept as well but more emphasis on stead fasting in spirit regarding your faith and total reliance on God coming through for you. In essence, never giving up on his Word. I try not to pester God because I know that He knows my needs and wants before I even come to Him about it. But I also know that He's my father. And even though parents understand the needs of their children, it would be nice for them to ask and say thank you for it, right? But I do pester Him on things I take very seriously. For instance I pray for the children in my family and int he world on a continuous basis. I know He heard me the first, but I just feel like the more I pray about it the more I'm showing God that I'm serious about whatever is pressing on my heart or mind. Good Lord, I feel like I just totally rambled...and i'm not deleting a thing! 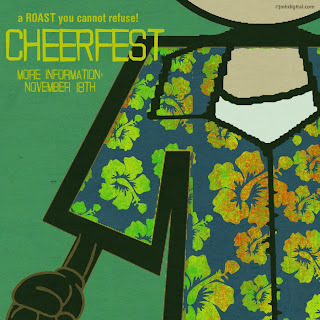 David -- This post will probably add fuel to the Cheersfest fire. Will I become a Yule log? StMc -- You have missed the intent of the message as I received it. Life is a persistent existence and it's how and where and to what purpose we apply our persistence that shapes our thinking and our sense of gratitude. You are generalizing based on your experience and the conclusions you've drawn from that experience and that may not be totally fair. You and I both blog with importunity and that comes across from the ongoing nature and subject matter of your blog posts and I would presume in the reading matter you recommend and probably in the conversations you have with people you hang out with. Maybe you've got it all figured out, but I still question many things, listen to what others have to say, and am willing to change my way of thinking if I am moved to do so by logical deduction and spiritual directing. But I have a pretty muddled mind and am not as smart as I would like to think I am. That's why I blog with importunity. And I think the phrase is fun to say and presents an interesting concept (to me at least). Clarissa -- Thank you for your heartfelt and interesting comments. I think this concept of "pestering" God is more related to Kierkegaard's suggestion that The function of prayer is not to influence God, but rather to change the nature of the one who prays. The concept of prayer is more suited to a book or a very long essay and not for a blog post or a comment so I won't get into this. And really that wasn't my intent in this post. I was thinking more from the perspective we each have certain driving issues that shape us and what we try to convey to others. It's kind of like "Rosebud" in the film Citizen Kane. I don't think you'll bore folks if you make the subject matter interesting. That is always my goal though I don't know if I always succeed at that. I sometimes feel I am repeating topics, but I try to give a different slant to the same topic to bring about a novelty factor. There are some things I go back to, like my hatred of plastic, but mostly I stay away from conflict. There are some blogs that are extremely random, but MOST tend to blog with importunity. I know that I have favorite subjects that I tend to return to in one form or another. Most Writer Blogs tend to approach various aspects of the writing process. Political blogs tend to roll around those ideas. Economics blogs dissect what is going on economically domestically and globally. In other words, we all have our Favorite Subjects. I don't think that blogging with importunity is a novel concept. However, I also like the word and can see why you dedicated a post to it. Do you think we live our lives with importunity... very focused on a few subjects that hold our interest while all else falls by the wayside??? My blogging took a dove tail this year. Work, family, and writing took huge chunks of my time away from me that I could devote to blogging. But I'm positioning myself to get back to my roots and be a much more persistant blogger and visitor of other sites for 2014. Rachna -- The different slant is what keeps an idea fresh. Bish -- So true about getting what you ask for. That is one that has backfired for me a few times. Robin --The way I see it is that if we are real then we are who we are. If we try to be everybody then we are nobody. Some people do seem to have a wider range of interests than others, but I think we all have a Rosebud in our lives. Stephen Tremp -- Life has to take precedence to blogging or we are living in a cyber world that is too esoteric and intangible. I have been the same way as you describe to a degree. I probably need to stay where I've been and hopefully find better ways to manage my blogging and internet time. There are other things besides those. My posts tend to be long, because back in the day, blogs were online journals. I just can't keep my posts short. So I guess those are three areas I feel strongly about and have done a series of posts about them over the years. I don't think every storyteller gets stuck on the same story, but I think some do. Like Tim Burton. Almost every movie he's made has just been some variation on Edward Scissorhands. And David Eddings, once he wrote The Belgariad, just continued to tell that same story over and over again in everything he wrote after that. I only have a certain amount of repetition I can deal with in myself. If I'm getting tired of saying it (like "please leave a review"), I'm making the assumption other people are getting tired of hearing it. So stoked for the CheersFest, Arlee. You will be perfect! The posts are going to be great! Despite Stephen's critique, that sermon was not all bad! At the very least, it (indirectly, through your post) added a couple of words to my inventory. I never had heard the word "importunity" or "importunate" before. As it turns out, I have often been quite "importunate!" Jay -- I have the long post problem or however one wants to look at it. Once I get going on a topic I like to explore every angle. Like you indicate, if we feel strongly about some topic we'll keep returning to it until we're exhausted it for ourselves or it stops making us money (well I guess you didn't say that last part). Andrew -- So maybe you can just keep finding different ways of telling people to leave reviews. Tell 'em until they actually do it. Morgan -- I don't go as deep as I probably could, but I do like to write about things that are on my mind especially when I'm trying to figure them out. Larry -- And I wasn't even trying to be controversial. Stephen just read between the lines and wrote in his own lines to stir things up. I'd heard the words before but never really thought about them much or knew what they meant until I'd heard the sermon. Then I just became inspired to use them in a sentence like back in school. I too have been importunate. And McCarthy is probably more importunate than both of us together. Maybe I touched a nerve. On the one hand, that sounds so easy to do, but, on the other, it just gets tiring to have to ask people the same thing over and over. Like with my kids: it's tiresome to have to tell them repeatedly to do the same chore, so they just lose quarters when I have to tell them more than once. I can't do that with blog readers, though. Wouldn't that be a lot like spam? Just sayin'. Andrew -- Importunity with a creative touch? Yeah, it might get on people's nerves. I guess you could make a contest out of it or something. You'd think writers who read would leave reviews. Do unto others kind of thing? I actually tried the contest thing once. I even offered (the best) chocolate (in the world) as a prize. I got two reviews. And, yes, I would think that, but it seems like a thing that's worse than going to the dentist for a lot of them. What gets me, though, is that I'll get an email saying "hey, I really liked that," to which I will reply, "Could you say that in a review?" The response is always something like "sure, when I get time," and the review NEVER happens. CW -- I guess the difference would be that it would not be imposed upon anyone and the intent would be different. But if you wanted to suggest that repetition is comparable to spam then life itself is spam. Gosh now I feel like I'm reading a menu in a Hawaiian restaurant. Spam sushi anyone? Andrew -- I remember that chocolate contest. With odds like that I should have entered. I think there might be a paranoia factor as well. If an author reviews your work then they might think you will be compelled to reciprocate and review their work. That probably terrifies them as you are scary with honesty and saying what you think. What if you didn't like what they wrote and had to reciprocate. Do you maintain your integrity or lavish the author with a faux nice review. Does that author want to know? Do they dare take the chance? That's the reason I've read where some writers don't want to give any other authors a bad review, but they won't give any review as well. Yeah, I get that. In fact, I've had some people ask me -not- to review their work. Of course, that means I'm not going to read it because why waste the time on reading something I'm not going to review. My issue with that is that if you're going to publish, you have to be willing to take the bad review. Personally, I'd rather have a bad review than no review. I think it's natural to write about similar ideas. As long as you continue to present them in interesting ways, your audience will never be disappointed. Looking forward to your roast Lee! Spaceguy -- Excellent example. There are some I'm sure who are interested in that sort of thing. Julie -- Write what you know is the oft-given advice. This is like the importunistic character Sheldon on The Big Bang. One of his funny annoying habits is to repeat the same phrase like when he knocks on his neighbor's door and shouts, "Penny, open up. Penny. Penny. Penny. Open up..."
Be one with yourself and use your blog to focus on what's important. I worry about repeating myself or hitting on the same topic too often in my blog. I don't want to be boring. In a way, I guess the same is true about prayer. The Scriptures tell us to pray often but I never quite get past the feeling I'm "bothering" God. Jagoda-- Good example. The word is what inspired the post. I liked it and the meaning and couldn't help but relate it to blogging. Chris -- I'll have to look up the roots and origins of the word. Your deduction makes sense. I guess "importunity" could be likened to forced and urgent opportunity. LD -- I usually stick to praise and thankfulness in prayer, but I've been a bit more importunate of late. And I'm sure I'll be staying close to my blog themes as well, but I hope they sound different each time I do them. very interesting post. I hadn't thought about it, but when I was worried about Buddy dying, I posted several times about him. Thanks for the mental fodder. Importunity…such an interesting word. The word badger comes to mind, animals known for being tenacious, which I believe you were trying to allude to in your last paragraph. Presenting material in different ways helps people learn better. It provides opportunity for those who learn differently to understand in ways that might make more sense to them. Can't find fault with a good wordsmith, my friend. Boring and annoying don't fit the bill at all. LinnAnn-- Hope Buddy is doing okay and it's good to see you here. MJ-- Repetition also allows me to present a case from different perspectives so that if someone didn't see my argument the first time maybe in the second presentation they'll come around to my point of view. Kind of a followup to our comment exchange-I really had never heard the word before, and in fact, am thinking if I heard it during a sermon, I would have misheard what the priest was saying. When I first read your post title, it registered as "impunity", so I was expecting a very different topic. Larry -- Could be that it was translated differently too. Or the word just passed by you when you read it or heard it. I never paid much attention to it until the sermon was built around the word. Love your posts and your series. Keep them coming! I need to blog with importunity more as I often question myself and why I'm doing this for. However your sermons usually right my ship. Thanks!